Helen M. Peer, 97, passed away after a recent illness at 2:45 p.m. on Tuesday July 3, 2018, at Miller’s Merry Manor in Plymouth. A Marshall county resident her whole life, Helen was born in Culver, Indiana on March 28, 1921, to Guy V. and Trella E. (Thompson) Kepler. She graduated from Culver High School with the class of 1939. Helen married Philip A. Peer on Nov. 9, 1941, and made Plymouth their home ever since. They shared 52 wonderful years together until his passing on Oct. 5, 1993. 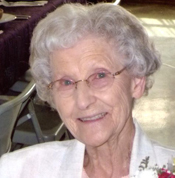 She was a member of the Santa Anna United Methodist Church, auxiliary of St. Joseph Regional Medical Center and the Marshall County Extension Club. She worked for Lauer’s Men Clothing as a tailor for nearly 20 years. She enjoyed sewing, reading, working outdoors and tending to her garden. She also was an excellent cook who enjoyed cooking for her family. Helen Peer is survived by her children: Betty Jane (Darrel) McGriff of Marion; Beverly (Donald) Morgan of Andrews; and Steve (Naomi) Peer of Goshen; five grandchildren: Robert (Kay) McGriff, Pamela (Ed) Dillon, Stacy (Lance) Best, Paul (Becky) McGriff and Ken (Andrea) Peer; two step-grandchildren: Melissa (Larry) Towne, Donald E. Morgan; ten great grandchildren, four step-great-great grandchildren. Also surviving are her two sisters-in-law: Doris Kepler and Patricia Kepler. She was preceded in death by her parents, husband, two brothers, John and Robert Kepler, and two sisters; Letty Masten and Jane Warner. Visitation will be held from 6-8 p.m., Monday, July 9, at the Johnson-Danielson Funeral Home, 1100 North Michigan Street, Plymouth, IN 46563. Funeral services will be held at 11 a.m. Tuesday, July 10, at in the funeral home, with Rev. Charles Krieg officiating. Memorial contributions can be made to the Santa Anna United Methodist Church, 14583 West 20A Road, Argos, IN 46501 or to the Center for Hospice Care, 112 South Center Street, Suite C, Plymouth, IN 46563.